Thank you for Supporting Stuff the Bus! Thank you for helping us again set our local students up for a great academic year by generously donating to help provide school and classroom supplies for 8,500 Monroe County students! ﻿With the community's support, UWFK directly raised over $17,000 and an additional $32,000 was donated through the Publix 'Tools for Back to School' campaign in their check-out lines...that means we raised nearly $50,000 to purchase supplies that students need to succeed! The Stuff the Bus campaign addresses two of UWFK’s focus areas—serving working families and increasing educational access for children. We are proud of the way our friends and neighbors in the Keys come together year after year to help local students. Through this, we ensure that every child has the tools they need to succeed in school, creating healthier, happier families and stronger communities. This year, UWFK collected only monetary donations, to purchase exactly the items requested by the local schools. This change was in response to the principals' input after the overwhelming donations of school supplies received after Hurricane Irma. This allowed each school to create an Amazon wish list of items their students really need for a successful year, and UWFK used donated funds to purchase and ship the items directly to the schools. Items included new books for preschool,elementary and middle school students, headphones and keyboards for computer based learning, balls and baseball gloves for PE, paints and brushes for art class, chairs for students with specials needs, calculators, and more. No two schools had the same list of items needed. A Poinciana teacher says, "My 5th grade class would like to thank the United Way for the opportunity to purchase high interest level books for our classroom library. This added much joy to the 5th graders at Poinciana Elementary!" ~Angela Van Loon, 5th Grade ELA/SS Teacher. Thank you for helping Monroe County children succeed. 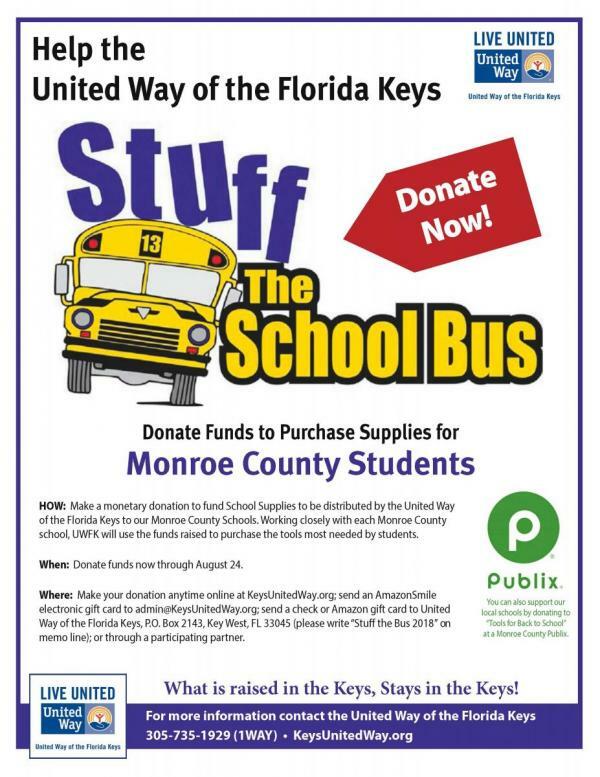 To see more on how our community generously supports our local schools, please visit our Stuff the Bus photo gallery.